"How High" — a medium-budget comedy, is one of the first studio features to be shot on 24P video, using the Panavision/Sony 24P camera. The picture features rap stars Method Man and Redman playing themselves and was directed by Jesse Dylan (Bob Dylan’s son). In this interview, editor Larry Bock and assistant editor Erik C. Andersen cover their experience editing the show: why it was produced this way, what it was like to work with the new medium and how it affected the post-production process. For a preview, the production installed a high-definition projector in the theater balcony. Standing: Robert Jacobs, tape operator from Video Applications, which provided the projector; Andersen; Bock; John Haley, audio engineer, Video Applications. 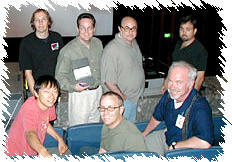 Seated: John Woo, assistant editor; Keith R. Brown, editorial production assistant; Daniel O’Keeffe, projection engineer at Universal. How did you prepare to work in this new medium? Bock: I first called my friend Michael Alberts, who recently finished cutting a low-budget film called Nicolas, the first feature shot with the Panavision/Sony 24P high-def camera. He walked me through the process and alerted me to certain problems we might expect. Then I called Erik, whose technological knowledge spans a wide spectrum of different areas in post. Andersen: I read everything available on 24P, including the articles in the Guild Magazine. I also spoke to a couple of assistant editors who had worked with the format. Bock: We also attended the camera and sound tests for How High at Panavision. I was worried because it seemed like there were so many opportunities for something to go wrong with sync or timecode. But things went very smoothly, thanks to the efforts of the film crew and my team. What were some of the advantages and disadvantages of working this way? Creatively, working in hi-def was no different than working on a film show. In general, I was quite surprised at how much the show looked like it had been shot on film. Andersen: Director Jesse Dylan and director of photography Francis Kenny had to contend with the fact that the Panavision camera didn’t have a full set of lenses. [At the time How High was shot, there were three zooms and one prime available; as of this writing, there are four zooms and five primes.] The camera cannot be under- or over-cranked, and it has contrast problems in bright sunlight and signal-to-noise issues in low light. The viewfinder is black and white, with very low image quality, but there is a color HD monitor on hand to check focus, lighting and actors’ performances. I was very impressed with the image quality on the monitor. What you see is what you get. One big advantage to using the 24P camera is that HDCAM tapes last 50 minutes (at 24 frames per second), much longer than film magazines, so the DP was able to keep the camera rolling between takes and change magazines less often. Production thought this saved roughly an hour a day and allowed for more setups, but it meant that we were getting a lot of unslated material that had to be sorted out in the cutting room. Were any other high-definition cameras considered? Andersen: They looked at the Panasonic AJ-HDC27A 720P DVCPRO HD camcorder, which has variable speeds of 3, 6, 12, 24, and 72 frames per second, but they were concerned about mixing 720P images with the 1080P material produced by the Panavision/Sony camera. It would have also have meant a second camera package rental and a new set of lenses for the DP. How did shooting on 24P affect your interaction with the crew? Bock: For me it was the same as always — no different than shooting on film. Andersen: I talked to the sound and camera department daily. One issue was pre-roll. The 24P camera records time-of-day code, which means there is a timecode break between each take. There were many times I was unable to digitize a slate because I only had a second of timecode before the director yelled, “Action.” I needed ten seconds of code and often didn’t get it. What was the workflow from the set to the editing room? Andersen: Hollywood Digital downconverted the HDCAM masters to Beta SP. They transferred the full 16:9 image letterboxed and added two timecode windows in the matte area: 29.97 timecode from the beta, and 24P (23.976) timecode from the master. The Beta was digitized into the Avid and we used audio from the Beta. Did you record audio on DAT as well as video? Andersen: Yes. Cameron Hamza, our sound mixer, hard-wired audio to the camera via 300 feet of specially-built cable. The sound went from the microphone to the mixing panel; then four tracks ran out of the mixer: two to the camera and two to a Fostex PD-2 DAT. On 35mm, the camera, sound and video playback departments work independently, but with the 24P camera, they are hardwired together with sound, video and timecode cables. We added two additional people to the film crew, a hi-def engineer and an extra sound assistant to wrangle all the cable. We received an average of three-and-a-half hours of material a day. Because there’s no telecine, one big change for the assistants was that we had to log the footage ourselves. One issue was how to record sound so that camera and DAT timecode would match. Production used an Evertz Afterburner, which produces a downconverted image and also converts the camera’s 23.976 timecode to 29.97, which was recorded on the DAT. Cameron Hamza used the Fostex DAT because it was one of the only field recorders that could lock to an external video sync pulse, which came from the Evertz. We thought about recording audio timecode at 23.976 but decided not to risk incompatibilities with post-production gear. The Afterburner has a processing time of about five frames. So our DAT timecode had a consistent offset relative to video, which was easy for the sound department to fix in post. As a test, I digitized from the DAT, then synced in the Avid via the slate. After accounting for the five-frame offset, I found an additional one-frame audio advance. We discovered that video processing in the camera delays the image by a frame as it is being recorded. The camera is actually out of sync with itself! To address this, Hollywood Digital delayed the sound by a frame when they downconverted our dailies to Beta SP for cutting. How did cutting room procedures differ from those on a film show? Bock: Since we didn’t have to wait for negative to be processed, Erik was able to digitize the footage and I was able to cut the scenes within 24 hours from the time they were shot. On film, we would have been one or two days behind camera. John Woo was the second assistant editor, and Jessica Caggiano was our apprentice. After principal photography we let go of the apprentice. It was the smallest crew I ever had on a feature. Andersen: Because there’s no telecine, one big change for the assistants was that we had to log the footage ourselves. We used Avid MediaLog hooked up to a Beta SP deck. John logged everything; in case the director asked for a non-circled take, I could load it immediately. John would log the first tape, start the Avid batch digitizing and then go back and continue logging. We tried to keep digitizing non-stop, while Larry and I viewed half-inch dailies in another room on a projection TV. We didn’t actually see the high-def footage projected until we started onlining for previews. Bock: Normally I would be sitting next to the director in a screening room getting some notes and a sense of what he had in mind. We didn’t do that on this show. Jesse looked at dailies on VHS in a trailer. We never looked at the HD material projected and we never sat in a projection room in a group situation. For me, that was very different than previous experiences. How did the experience differ for you creatively? Bock: Creatively, working in hi-def was no different than working on a film show. Were there any problems with the Avid? Things you wish the system would do? Bock: We knew going into this film that the Avid was the only system that could handle the workload and the amount of temp effects we needed. It was also the only system that would handle the 24P issues. Andersen: We used a Windows NT Avid Symphony, which belonged to the production company, Jersey Films, as well as a Mac-based Meridian Film Composer from Runway, and tied them together with Unity storage. Due to the fact we had a 2 GB project with over 600 files, the system took a long time to auto-save and redraw the bins towards the end of the show. It took an hour to back-up on a DVD-RAM disk each night. I would like to see Avid design an automated backup utility that would work in the background. What were the financial implications of shooting on video? Andersen: The 24P cameras rent for double the price of a 35mm camera, but the cost of HDCAM tape is considerably less than 35mm film, developing and printing. The high definition on-line and color correction bays we used for previews and final cut cost hundreds of dollars per hour, but as more shows shoot in HD, those prices will drop. But even with all the unexpected expenses and the tests we did, the budget for HD post-production was still comparable to a traditional film show. Did you receive more footage than you would have on a film project? Bock: Jesse kept the camera rolling to make sure he captured the most comical moments. We received an average of three-and-a-half hours of material a day. By the end of principal photography, we had the equivalent of over 750,000 feet of film. Andersen: By the end of the show we had a total of about 400 gigabytes of storage, with our dailies digitized at 14:1. That’s 75 hours of material for a 90-minute movie. Did 24P make a difference in how you dealt with visual effects? Andersen: With the Windows NT Avid Symphony, we could have on-lined the show in NTSC, not hi-def. We would have needed a lot of extra storage to reload the selected material and assemble it uncompressed, so for the projected screenings of the editor’s and director’s cuts we decided to just output the 14:1 compressed image. For our previews, we on-lined using a Fire at Hollywood Digital. The Fire is an uncompressed HD non-linear editing and finishing system made by Discreet. We used it to digitize our HDCAM master tapes, which were then auto- conformed to our EDL, laid back onto HDCAM tape and color-corrected. One big issue with the Fire and with a linear HD online, as well, is that if your effects can’t be described in an EDL, you have to rebuild them in online by hand. After the online, I loaded the finalized Fire effects back into the Avid and cut them in, so that we wouldn’t have to create them again for additional previews. Andersen: We had three previews, projecting HD using a Panasonic PT 9600U, 1280 x 1024 projector. Bock: Getting ready for previews was very time-consuming, because we had to on-line, color-correct, layback audio to each reel, then tie the film together to make one HD master for screening. But I was surprised by how clean and bright the picture looked when I first saw it projected in high-def. Back when I cut on film, we would preview the print with thousands of splices in it. Then I started cutting on non-linear machines, and the assistants would conform the work print. I thought the film looked a lot better, because it was not being handled as much and had less splices and dirt. Now with high-def, we get to project a spliceless print that has been color-corrected. Although I still prefer the look of a movie shot on film, I was pleasantly surprised that the image didn’t have a pronounced video feel to it. But I was worried about how we would handle the changes from one preview version to the next. Andersen: The Fire editor recommended archiving our first preview on D5 tape, then loading it back into the Fire. He conformed the first preview to the new cut on his own — we didn’t load any of the onlines into the Avid. We did this for all three previews. The previews gave us our first audience reaction to the 24P image. No one in the audiences noticed that the movie hadn’t been shot on film, and in fact, there were compliments about how nice it looked. Will this film be blown-up to 35mm for release? Andersen: The movie won’t be projected digitally — it’s a film-only release. E-Film did our scan to negative, and Deluxe is doing our prints. Since it cost several dollars per frame to scan the 24P to film, we did a variety of color tests on selected scenes. Our first test was printed on Kodak Vision Print Film 2383. It showed us that we needed a little more contrast in the blacks — the image looked a little flat. For our second test we printed the same negative on 2393 and found that it had more grain and less definition, but the shadows blocked up. So we went back to our color-corrected masters from the first two previews (which had been color-corrected differently), pulled two new scenes, scanned them to 2383 and made a new film print. We discovered we needed to color correct for the film transfer, not for HD projection, and that took care of most of our problems. Each projector is different and we found that, during previews, trying to compensate was pretty frustrating. Bock: Because we were color-correcting on tape, we were able to use power windows, soft clipping, and keying, which wouldn’t be available on film. But I was worried about what would happen to all that work when the show was scanned to film. In general, I was quite surprised at how much it looked like it had been shot on film. Were expectations different from what they would have been on a film project? Were you expected to work faster? Bock: They always expect you to work faster. I don’t think shooting with the 24P hi-def cameras has changed that. Overall, was the experience a good one? Would you want to do it again? Bock: For me, the experience was good. A couple of aspects of the 24P process did create extra work. Jesse asked me to look at everything he shot, including uncircled takes — three to four hours of footage every day, which meant I had less time to edit. I guess I would still prefer to work on projects that are shot on film, but it seems like high-def might become a common medium for features. The answer prints I’ve seen looked good. Maybe not as good as film, but for a comedy like this, I don’t think the audience will ever know how we shot it. Andersen: With technology advancing so quickly, the image will only get better. I consider myself very lucky to have worked with Larry on the first HD feature for Universal, and I look forward to doing it again.